The Errol Flynn of cricket. This was how Keith Miller had described Syed Mushtaq Ali. "Dashing, flamboyant, swashbuckling and immensely popular wherever he played," the Aussie added. Perhaps, not too many know that Mushtaq Ali was India's first Test centurion abroad. He achieved the feat against England at Old Trafford, Manchester, in 1936. It was the very Test in which Mushtaq Ali (112) and the late Vijay Merchant (114) put on 203 runs for the first wicket in the second innings and helped India save the match from the jaws of a certain defeat. Mushtaq Ali's brilliant, attacking batting (his hundred coming in a shade over two hours) had the English gasping. So much that the great C B Fry told him: "Ranji would have been the happiest man to witness your innings." 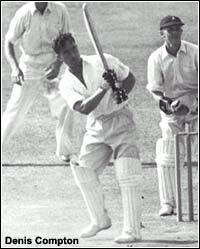 Neville Cardus wrote: "His cricket at times was touched with genius and imagination." 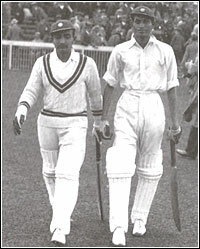 Incidentally, Mushtaq Ali and Merchant had forged India's first genuine pair of world-class openers. Compared to Merchant, who exemplified the Mumbai school of batsmanship, not much has been said or written about Mushtaq Ali, who was an entertainer pure and simple. Merchant was a technical wizard, whose one eye was always on his personal achievements. Mushtaq Ali, on the other hand, never tended to be selfish a wee bit, even in his wildest dreams. Positiveness was his watchword and he believed in giving the paying public their money's worth. Spectators, whom Merchant had often bored to death with his utterly slow batting, simply went gaga over Mushtaq Ali. Handsome and majestic, Mushtaq Ali was a people's cricketer. He was blessed with wrists of steel and hawk-like eyesight. His timing was super and so was his placement. He had a large repertoire of shots and he relished cutting, driving and pulling with the confidence of a man who knows his ability. He was a simple, cheerful soul, on and off the field, who did not know the art of diplomacy, something Merchant was master of. Mushtaq Ali was a thorough gentleman who firmly believed in playing the game, literally and figuratively. It was clearly on account of petty politics, which is rampant in Indian cricket since time immemorial, and World War II, that Mushtaq Ali did not have a long, fruitful Test career. A batsman of Mushtaq Ali's calibre deserved to play many more Tests than he did. He represented Indian in only 11 Tests and scored 612 runs at 32.21, including two centuries. Although not unimpressive, these figures do not portray the real Mushtaq Ali. Nor do they do any justice to his magnetic batsmanship which was worth going miles to see and enjoy. He may be 87 now, but Mushtaq Ali has retained much of his enthusiasm, exuberance, and energy. He still looks fit, trim and magnificent. What strikes you about him as you meet him today is his vitality and vivacity. Age has not withered him and he still speaks with that sweet, manly voice of his. Excerpts from a freewheeling conversation Haresh Pandya had with the maestro at his abode in Indore. Having played in altogether a different era, what major difference do you find between the cricket seen then and now? Not much. They still use three stumps, two bails and one ball ! Everything is still there. But we used to wear white flannels. The shirts used to be invariably full sleeves. Now they put on colour clothing, thanks to one-day cricket, and most of them seem to feel comfortable in short-sleeved shirts and T-shirts. Many of them wear the hat instead of the traditional cricket cap. The helmet is also there alongwith so many other protective gears. They're unheard of in our times. Seriously speaking, cricket has undergone a sea-change today. How do you react to this change? Well, it may be good for modern players but, being one of the old school, I don't like it to a large extent. To me, it's not traditional cricket. Did you foresee this change at any particular time during your playing days? Yes and no. Cricket was so much tradition-bound in those days that it was seemingly difficult to imagine any change could take place. We're brought up that way, we played cricket that way. But then there were also signs that made you wonder if the game would always be played the same way. The 1932-33 series in Australia, now infamous as Bodyline, probably hinted at the things that were sure to come. Even so we didn't believe that a time would come when something called one-day cricket would dominate the game completely. How do you look at one-day cricket, anyway? Well, what can I say? It's fine and people seem to enjoy it. It may be very entertaining and also a big money-spinner but it's not real cricket. Test cricket is the cricket. I've a feeling that even players prefer Test cricket to one-day cricket because it gives them ample scope to show their real talents. Test cricket is the test of your true skills, ability and concentration. I think it's foolish to think Test cricket will struggle for survival. I've been hearing this argument for the last many years but Test cricket is getting stronger and stronger. Look at it objectively and you will agree that Test cricket continues to be thrilling, throbbing and thriving. What do you like about today's cricket? I think they play good, competitive cricket today. There are so many outstanding cricketers and I can't belittle them. They are scoring runs and taking wickets and also making a lot of money. But they should put on their blazers. Most of them don't and they appear to be following this trend everywhere now. When we used to be introduced to the royalty, the VIPs, we were always immaculately dressed and in blazers. It's a very rare sight to see players introducing themselves in this manner today. Players of your era used to take genuine pride in playing for their country. The same cannot be said about many of today's cricketers. Don't you think the India cap has become cheaper, literally and figuratively, nowadays? Yes. When I played my first Test, I was hardly 19. I think it was a record of sorts which lasted for about 40 years. There were three selectors -- all Englishmen. They did not take into account factors like which state I came from, which 'group' I belonged to. Nothing of the sort. They picked me purely on merit. What they probably believed was that if given an opportunity at the right time, I would do something for the naional team. They took into consideration my talent and nothing else. Unfortunately, they don't look for talent today. What matters today is infulence, nepotism other such ills. If you notice, scores of youngsters have played for India in the last ten years. But only a handul of them have survived the test of time. Others haven't remained even names today. They're long forgotten. But then this is what happens when the selectors don't do their job honestly. It's the country which suffers in the end. How do you look at the players making pots of money out of cricket? Compared to them we were paid pittance, really. But I don't grudge the money they earn. I think they deserve every bit of it, considering the hard life they live. They play cricket day in, day out and remain away from their families for so long. I pray they earn more and more money. But when they've so much money, they should do something for the game. They should try and help those who can't afford to pursue an expensive sport like cricket. They should pick up talented players from the poor class of society and sponsor them. They should take care of their basic needs -- their education, cricket coaching and equipment. When cricket has given them so much -- name, fame and money -- it's their moral duty to do something for the game and its young, aspiring practitioners. I know there are some celebrated cricketers who are already doing what I am trying to say here. But more and more star players should come forward and lend a helping hand to the needy. We have been playing Test cricket since 1932 and yet our overall record, home and away, is not something we can feel proud about. Why is it so? Cricket is a very funny game, isn't it? But it also tests you severely. For example, in hockey and football, eleven men are pitted against another eleven. And everything happens in a short span of time. Now compare cricket with these sports. It's of a very long duration. Here you have one player playing against an entire eleven. If you add the two umpires, too, he's actually up against thirteen individuals. If you make a mistake, you are back to the pavilion. I mean you have to take into account so many factors when you try to judge a team or a cricketer's performance. The element of luck also plays a crucial role. But, yes, we haven't done that well in Test cricket, overall. Why are we unable to produce many genuine fast bowlers? Aren't our docile pitches also a big factor? In India they prepare pitches which last five days. The idea is, you should prepare wickets which suit your bowlers. The logic probably is that if the match lasts five days, they will earn more money. This is not merely an Indian phenomenon. All countries do the same more or less. But don't forget this is the very country which has produced fast bowlers like Mohammed Nissar, Amar Singh, Dattu Phadkar and Kapil Dev. Of course, they happend despite the system and not because of it. Who were your cricketing heroes? C K Nayudu, Keith Miller, Frank Worrell and Denis Compton were the batsmen I admired the most. As far as bowlers were concerned, I was immensely impressed by the English spinner, Hedley Verity. It was quite a challenge to face him, especially on a turning track. "Nobby" Clark, the English fast bowler, was also very good. You had to be very careful to bat against him. As I said earlier, I also liked our own Nissar and Amar Singh. Nissar was a fast bowler and a gentleman. Amar Singh was exceptionally good on bad wickets. In fact, he was a great all-rounder. Even at this age I'd like to go down walking ten miles to see all these players in action. They were so great. Who was the best captain you played under? C K Nayudu was easily the best of 'em all. No, my admiration has nothing to do with Nayudu also hailing from Indore! To me, he was the very definition of a cricket captain. He was intelligent, imaginative and adventurous. He knew fully well how to use the limited resources at his command. He was a strict disciplinarian who always supported his players to the hilt. He had a thorough knowledge of the game and its finer points. He had also this knack of detecting a flaw or two in the rival batsmen and bowlers. He was also a good 'reader' of the wicket. Did you ever aspire for the national captaincy? No, never. I was an easy-going man. I never ever thought of leading the side. I was just interested in playing and helping the side in whatever way I could. I loved to field anywhere on the ground without any other bother -- a luxury which a captain can't afford. You were said to be a terrific crowd-puller, one who never played for the morrow. Why was your approach always so? I always played for my team and for the crowd. The fact is there are 40,000 people who have come to see the game spending a lot of money. They sit for hours braving the hot sun or severe cold. They are there to see something which they can't do themselves -- play competitive, quality cricket. So it's the duty, even responsibility, of the players to entertain them and reward them with something which they can remember for too long. Very often had I hit the ball pitching outside the off-stump in the on with roaring success. And they would return home completely satisfied. Their feeling would be, "Ah, aaj kya cricket dekha. Maja aa gaya. Paisa vasool ho gaya ." Today everything looks so simple, so monotonous. Your supporters had once vehemently protested against your omission from the Indian team and the selectors had to give in. Could you recall that incident? Yes, that was immediately after the war. The Australian Services XI was touring India. Although I was selected in the Indian team for the first "Test", I could not play owing to illness. But they dropped me for the second Test in Kolkata despite my being fully recovered. Now this was something the Kolkata crowd was not prepared for. I had already scored a century at the Eden Gardens, the venue for the third "Test" against Lord Tennyson's side, in 1937-38. So hundreds of my fans walked in protest to the Eden Gardens pavilion. They were threatening the very "Test" with placards and slogans -- "Bring Back Mushtaq Ali", "No Mushtaq, No Test" and so on. Before anyone could understand what was happening, they broke into the pavilion. Their intentions were visibly violent. Some of them grabbed Kumar Shri Duleepsinhji, the chairman of selectors, by his tie and began to manhandle him. Luckily, I was there to save him. Varna unka bahoot boora haal ho jata . I asked them not to be so rude and violent and assured them that I would definitely play. Ultimately, the selectors were left with no other option but to select me. Were you a natural opener? No, I was made into one. Of course, I was always prepared to bat at any position my captains thought fit for me. But remember one thing: I played a couple of my early Tests as a bowler. I was a good left-arm spinner who could also bat competently. Douglas Jardine was my first Test wicket. I was an orthodox bowler, like Vinoo Mankad. How was it like opening with someone like Vijay Merchant? Well, I had a good combination with Mankad. Merchant was good but he was slow in running between the wicket. Is it true that one of your captains had instructed you to run Merchant out because he was such a slow batsman? No, it isn't true. I was never told by anybody to do so. I think Merchant knew his responsibility well and also what was expected of him. You were a member of the Indian team to England in 1936 when Lala Amarnath was sent home by the tour management committee. Could you throw some light on the ugly incident? I think both Lalaji and "Vizzy" [Maharajkumar of Vizianagram] were at fault. We're playing a Minor County match. D D Hindlekar and I went to open the innings. Lalaji was to come in next. The Indian batsmen made merry and I think I scored a century. "Vizzy" kept Lalaji waiting padded up and sent in other batsmen in his stead. When he was eventually sent in, Lalaji was furious and got out quickly. When he returned to the dressing room, he was livid and threw his bat. He was also heard using choicest expletives in Punjabi. The tour committee felt Lalaji's behaviour was unbecoming of a gentleman cricketer and decided to send him home. However, all the senior cricketers went to "Vizzy" and requested him not to take such a harsh decision. But to no avail; the die was cast. I think Lalaji should have willingly obeyed and respected the captain's wishes. He should have been prepared to bat anywhere in the order. When you represent your country, and that also on a foreign soil, you carry a lot of responsibility. You can't be so rough. But Lalaji became rough and paid the price. Nevertheless, it was a very sad thing to have happened to a player of his eminence. Indian cricket has never been without its share of politics. It was very much there in your times and it is there even today. Your comments? In my times, cricket was patronised by the kings and princes. It was because of this that "Vizzy" became the Indian captain despite his poor cricketing skills. It was none of his business to play for the country, let alone lead it, but then the board didn't have money at that time and maharajas like "Vizzy" used to support the game. Not only that, they used to literally run cricket. So when you give money and also run the game, you would also covet the captaincy. Today it is different. Now we have business maharajas and politicians running the game and using their political clout to their own advantage. Considering your genius, one would think you didn't have as distinguished a Test career as you should have. Maybe, you didn't have enough opportunities. Maybe the selectors didn't treat you fairly. Are you satisfied with your India career? Yes, absolutely. I've no regrets whatsoever. I've no complaints, no grudges, no ill feelings against anybody. I'm quite happy about whatever I played, whatever I achieved. I may not have played too many Tests for a variety of reasons but I don't think I failed to make a lasting impression on the minds of those who know and understand the game well. If it had not been so, you would not have come from a far place to meet me. I've many fond memories of my career which I cherish the most. I've rubbed shoulders with some of the finest cricketers ever. They all rated me very high which was heartening indeed. If it was in my destiny to play only 11 Tests, nobody could have changed it. Do you have any message for the institution called Indian cricket and cricketers? All I'd like to say is long live India and long live Indian cricketers. We've so many talented cricketers coming from different parts of the country. They should be properly groomed and given the opportunities at the right time. Our present team is quite good, what with players like Sachin Tendulkar, Sourav Ganguly, Rahul Dravid, Javagal Srinath and Anil Kumble in its ranks. But I must say we should never forget the contribution to Indian cricket in its early days by players like C K Nayudu, D B Deodhar and others of their ilk. It was because of their presence in our domestic cricket that we got the Test status in 1932. If they had not played good cricket, the Englishmen would not have allowed us to play Test cricket. © 2001 rediff.com India Limited. All Rights Reserved.